In my continuing research to find a good solution for sharing pictures from my Sony digital camera while traveling without a PC (see previous post), I found a German company which makes portable backup and viewing devices targeted to professional photographers. The company is called Jobo. They produce a device (about the size of an iPod), the Spectator which allows for the selective backup and copying of files from CF/MD/SD/MMC/MS memory cards. It also allows you to view of JPEG files on the 2.5" screen or an external TV. The Spectators comes in a 40GB, 80GB, or 120GB model. The Spectator would allow me to selectively copy pictures from my Sony camera's Memory Stick to the Micro SD card used in my AT&T Tilt via the internal hard disk. I would then share the pictures using the Kodak Gallery email service using Exchange ActiveSync on my Tilt. 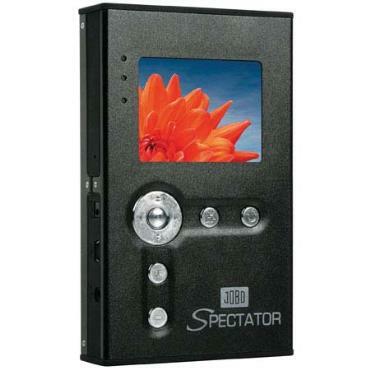 I could also use the Spectator as a backup for my camera and not have to worry about running of space on my 4GB Memory Stick. I priced the 40GB model for $245 at Adorama.com (link). A little pricey for a single purpose device and would mean traveling with another device but it would help solve my dilemma. It is really too bad Apple has discontinued development and support of their iPod camera adapter. It would be a great a great accessory for the iPhone or Touch. Maybe a third party will step up after the iPhone 2.0 firmware is released...I can only hope. The Jobo Spectator, it won't win any design awards but it is a utilitarian device. The size and weight are perfect for traveling. The screen size works well for viewing pictures and movies. The camera's sensor does not deal well with too much light. The results are streaks in the image, which can be seen on the view finder. Adjusting the camera's position solves the problem 99% of the time. It seems that the camera's sensor was designed for low light with an ISO capability of 1000, and it does not handle bright light situations well. The inability to zoom in video. The video quality is excellent, however it would be very nice to be able to zoom. The lack of aperture priority has not bothered me, although it might help with the bright light situation. Now that I have found Adobe's Photoshop Elements 5.0 and Sony's Vegas 6.0 Video editing application work well together, I can easily create DVD photo shows of my travel memories (see my discussion here). I just noticed that the price of the camera as dropped to around $224. When Sony allows a price drop like this, it usually signals the end of a model. This is probably because the DSC-W100 is basically the same camera with 8 mega pixel sensor, however it sells for $299. At $224 the DSC-W70 is really tough to beat. All of my posts related to the DSC-W70 can be found here. I received the Adobe Photoshop Elements 5.0 and Premiere Elements 3.0 bundle. I installed both applications (I had to manually uninstall the trial version of Photoshop Elements). So far I am very impressed with Photoshop Elements 5.0, it is definitely ahead of the game compared to Microsoft Digital Image Suite 2006, however Microsoft has just released their Anniversary edition of Digital Image Suite. Unfortunately, Photo Story is still version 3.0 which means this feature is still behind what Adobe offers. The Slide Show feature in Photoshop Elements 5.0 provides very sophisticated image handling capability and the ability to add videos, however as I mentioned in my previous posts, its ability to manage soundtracks is lackluster and behind what Microsoft offers with Photo Story 3. In order to remedy this issue I purchased the bundled which includes the video editing application Premiere Elements 3.0. The migration of a Photoshop Elements Slide Show to Premiere Elements is performed using one click. Premiere Elements 3.0 is simple to use and provides basic video manipulation and DVD creation. I was able to add soundtracks using aac and mp3 music files from my iTunes library and control the volume of those tracks against narrations and video audio. This is exactly what I was looking for. The creation of DVD menus is a breeze with the ability to automatically create chapters and associated menu elements. I did find the preview to be slow and out of sync, Premiere Elements generated an video card error stating that my preview mode was reset to standard because my video card did not support advanced function. I just installed the ATI X1600 video card so I don't think so. Based on the Adobe user forum this seems to be a common problem when the whole video has not been previously rendered. I went forward and started the DVD creation, the rendering to create the DVD was very very slow. It took almost 4 hours to create a 6 minute DVD. The audio in the end result lacked fidelity and the slide pan/zoom and transitions seemed to be faster than what I had selected in the Photoshop Elements Slide Show function. I went back to the Adobe support forum and found 2 threads addressing the slowness of the product with advice to use Premiere Elements 2.0. It looks like Premiere Elements 3.0 is not ready for prime time. How a company could release a video editing product that renders a DVD so slowly is beyond my comprehension. I do have to say that everyone loves Premiere Elements 2.0 and a post urged me to try it. But 3.0 really leaves a bad taste in my mouth, especially since I tried Sony's Vegas 6 video editing application. The Sony Vegas 6.0 application is more advanced that what I need, but it works very well (I created my 6 minute DVD in less than 15 minutes), I decided to return my Adobe Photoshop Elements/Premiere Elements bundle. Given the integration between Photoshop Elements and Premiere Elements It is too bad they could not get Premiere Elements to work correctly. I went ahead and purchased Sony's Vegas 6 and will purchase the Photoshop Elements 5.0 upgrade. In conclusion, this is not the perfect solution I was looking for, but I think I have come up with a process that creates excellent quality DVD slide shows of our travel memories. Back from Scotland I decided to start putting together my slide show using Microsoft Photo Story 3. My wife and I went through the 400+ stills and videos to pick the relevant shots that best describe our time in Scotland. I started the insert process to find that I could not insert Mpeg video clips. Photo Story 3 does so much for you in picking transitions between shots, adding zoom and pan to still pictures, and creating an electronic music soundtrack. It really is incredibly easy to use, however in its quest to minimize the amount of options Microsoft left out what I think is a extremely important feature: the ability to insert video, In order to insert video I had to export the photo story to a Windows Media file (.wmv) and import it into another simple to use free program; Movie Maker which is included in Windows XP SP2, . With Movie Maker I was able to easily insert Mpeg videos, add titles and manipulate the soundtrack. However the quality of the still images with zoom and pan degraded considerably when compared to the video content. This made the end product look rather fuzzy, I was not satisfied with the results and went looking for other solutions. After a quick search, I found that there were only a two solutions that seem to integrate still pictures and videos. The recently released Adobe Photoshop Elements 5.0 and Apple's iPhoto/iVideo. I went to our local Apple store to check out iPhoto and iVideo, the products look good, however they are not that intuitive to use. Apple does an outstanding job in the industrial design of both product and user interface, however the function flow in their application leaves a lot to be desired. Maybe if you are an Apple aficionado it makes sense, but the mouse control and menu nomenclature is not intuitive. I am very intrigued by the Intel Mac (it really was a brilliant decision on Apple's part) and being able to boot both Windows and Mac OS, but I can't justify spending the money. Maybe when Vista drivers along with a good virtual PC capability to run Vista and Mac OS concurrently are available. I also found numerous posts from Mac forums that clearly gave the edge to Adobe's Photoshop Elements over Apple's iPhoto. I decided to download the Photoshop Elements 5.0 30 day trial. Photoshop Elements 5.0 is as intuitive to use as Microsoft Digital Image Suite 2006. For basic and intermediate photo editing reviewers have given both of these products high marks for quality, organization and simplicity. However, the Adobe Slide Show application, which correlates to the Microsoft Photo Story application, is much more powerful. You can see this right off with the ability to control each slide's time and to chain identical slide together to create very creative pan and zoom effects. You can also add Mpeg videos. At this point I am thrilled, although not happy I needed to purchase another product. I created my slide show easily, unfortunately when it came time to add a soundtrack I was dismayed at the lack of options. You can only import mp3 and wma files. What happened to aac? It hard to understand that a product team would omit aac in today's iPod world. I understand Microsoft not implementing aac but I don't understand why Adobe would not. As I dug deeper it became clear that the audio capability is pretty lame. It only allows you to create a single audio track, and even though you can add narration to slides, there is no way to control the volume of the audio track against the narration. To be fair I have not yet tried Adobe Premiere 3.0 video editing program (I could only download a trial copy of Premiere 2.0). Premiere 3.0 can be purchased with Photoelements 5.0 as bundle. The documentation refers to a link which passes content from Photoelement to Premiere for final editing and DVD creation. I found a comment on a forum pointing to using Sony's DVD editing suite Vegas 6. I have downloaded a 30 day trial. It is a very sophisticated editing suites allowing you to create multiple audio tracks which you can control individually. It imports aac tracks and I was able to create the soundtrack I wanted. I don't really want to spend the $86, however I have to say that it is a bargain and seems rock solid, although the preview was always lagging the audio. The DVD I created with it came out very well. I did have to use Nero 6 to create the DVD from a .wmv file, the trial does not allow direct DVD creation. Using Sony's Vegas 6 was a tangent so I could complete slide show. As an amateur tool, I am very impressed by it, but I don't do enough video editing to justify the $86 expenditure. After reviewing Adobe's 30 day return policy I am ordering the Photoelement 5.0/Premiere 3.0 bundle to see how it fares...Hopefully I should receive it next week. As part of the ritual of saving travel memories over the years I have gone from single lens reflex film based still photography to Hi 8 video to point and shoot digital still photography. In my goal to carry less while traveling I have made compromises, the two biggest have been the lack of decent zoom capability and the poor video quality of digital point and shoot cameras. Over 25 years I owned only 2 single lens reflex cameras the Canon TLB and the A1 along a myriad of Canon FD lens. The A1 was a fabulous camera, but over time the bulk got to me. Along with the laptop and the Sony Hi 8 video camera, it just got to be too much, so I decided to try digital photography with an Olympus 2.1 mega pixel camera. It was my first point and shoot, the picture quality was decent but could not compare with A1 and the video feature, although advanced for its time was unusable. I also had problem with the size of the camera, my goal was to carry a point and shoot in my pocket and the Olympus did not fit. As the pixels ratcheted up and prices came down I decided to try the 5.1 mega pixel Sony DSC-P10. Great size, very good picture quality (almost equal to the A1), better video but not yet good enough to use on anything but a PC monitor. With the DSC-P10, I started experimenting with digital slide shows. After trying several applications that are no longer around, I settled on the Microsoft Digital Image Suite (it had another name when I started using). Microsoft was ahead of the game when it came to creating slide shows. Photo Story 3 ,which can now be downloaded for free here, is extremely intuitive and produces decent results with the ability to easily add an electronically generated soundtrack. Sound is key to producing a more enjoyable experience for our forced viewing audience, remember the dry 35 mm slide shows and 8 mm movies we had to sit through in our youth. Back in June of this year before a trip to Scotland, my wife and I discussed taking the old video camera with us. I balked at carrying an extra piece of gear and decided to go examine the available technologies. I settled on another point and shoot camera, the Sony DSC-W70 (see my entries on it here). One of the key reasons from picking the DSC-W70 was its ability to create decent quality video at a 640 x 480 resolution and 30 frames per second. I am very impressed with the quality of the video and this feature is great while traveling. It is great to have one device to shoot excellent 7.1 mega pixel still pictures and very good quality videos, good enough to show on a television. It does not have all the manual adjustments of my previous cameras, but for the price it is tough to beat and it produces excellent quality stills pictures As good as my A1. I came back from out trip to Scotland with almost 400 still pictures and about 20 minutes of video, now I needed to assemble them together into a coherent story using Microsoft's Photo Story 3.0.